ROBERT TROUT: CBS World News, Bob Trout speaking. And again we bring you the available reports, all of them from German sources, on what the Berlin Radio calls "the invasion." There is still no Allied confirmation from any source. Correspondents who rushed to the War Department in Washington soon after the first German broadcast was heard were told that our War Department had no information on the German reports. There's been no announcement of any sort from Allied Headquarters in London. The first news of the German announcement reached this country at 12:37 AM Eastern War Time. The Associated Press recorded this broadcast, and immediately pointed out that it could be one which Allied leaders have warned us to expect from the Germans. Shortly after 1:00 AM Eastern War Time, the Berlin Radio opened its news program with a so-called "invasion announcement." Columbia's shortwave listening station here in New York heard the Berlin Radio say, and I quote: "Here is a special bulletin. Early this morning the long-awaited British and American invasion began when paratroops landed in the area of the Somme estuary. The harbor of Le Havre is being fiercely bombarded at the present moment. Naval forces of the German navy are off the coast fighting with enemy landing vessels. We've just brought you a special bulletin." End of the quotation. That is the invasion announcement as heard from the Berlin Radio by Columbia's shortwave listening station. Now here's what Trans-Ocean, one of the German news agencies, says, and I quote: "Early Tuesday morning, landing craft and light warships were observed in the area between the mouth of the Somme and the eastern coast of Normandy. At the same time paratroops were dropped from numerous aircraft on the northern tip of the Normandy peninsula. It is believed that these paratroops have been given the task of capturing airfields in order to facilitate the landing of further troops. The harbor of Le Havre is at the moment being bombarded. And," continues the broadcast, "German naval forces have engaged enemy landing craft off the coast." The Trans-Ocean broadcast, still unconfirmed, concludes this way: "The long-expected Anglo-American invasion appears to have begun." This is the full text of the German Trans-Ocean broadcast as recorded by the Associated Press. The German broadcasts on the long-expected invasion by the Allies were relayed both to North America and to Germans in the homeland. Germans at home were told by DNB's domestic broadcast at dawn in Europe. At 1:30 in the morning Eastern War Time, the DNB agency repeated the items describing what it called the "invasion operations." This was a departure from the usual DNB practice of giving fresh information at that time. The German-controlled Calais Radio came on the air today with this announcement in the English language, quote: "This is D-Day. We shall now bring music for the Allied invasion forces." So said the German-controlled Calais Radio across the Channel from England. Up to this time, almost an hour and a half after the first German broadcast, the United States Office of War Information, whose facilities will be used by American press organizations when Allied armies enter Western Europe, has not transmitted any information at all to support the German claims. Director Elmer Davis of the OWI rushed to his headquarters immediately when OWI officials advised him of the broadcasts from Germany. He told the United Press, "We have no more information than you have. I'll stay here until I find out whether the story is true or not." Last night, Elmer Davis addressed the National Press Club on psychological warfare, and showed three motion pictures illustrating how the OWI was propagandizing on the war front. He had just reached his home when his office called him to hurry down. By 1:45 in the morning Eastern War Time, almost the entire public relations staff over at the War Department in Washington also had reported for duty. Now, it should be remembered of course that the Germans are quite capable of faking this entire series of reports. Their main reason for doing so, in addition to trying to smoke out Allied plans, would be to try to start a premature uprising by the resistance movement along the Channel coast. But the French and the Belgians and the Dutch have all been warned about this possibility repeatedly, and you will recall that Prime Minister Winston Churchill some time ago warned that we could expect false alarms or diversionary feints before the big show began. The British Radio, which at 1:00 AM Eastern War Time sent a warning to residents of the Dutch coast to evacuate inland to a distance of at least eighteen miles, might really have been broadcasting the latest in the series of such warnings that have been given to the civilian populations all along the so-called invasion coast of Europe. No other British report that might indicate that the invasion is on has been released, unless we are to take as significant the report from London half an hour ago that the Royal Air Force was over enemy territory during the night. Even on the enemy side, there are clear reasons for doubting the German report that the invasion has started. 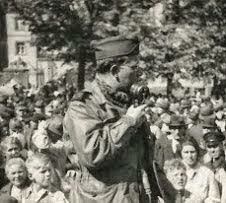 The Paris Radio, at 1:00 AM Eastern War Time, said nothing about any invasion operations in its regular news report. In fact, half an hour after the first German broadcast announcing the landings, one German-controlled Paris Radio spokesman said of the war situation, and this is a quotation: "It appears we have been given another month of grace before the invasion will start. A press report from Washington says Roosevelt will come to London at the end of June. Surely this indicates the event will not start before the end of June," said the Paris Radio. Well, as I said, there is as yet no reason to believe the German story. Nevertheless, because of high public interest in this country, Columbia is planning to continue overtime operations tonight to all of its affiliate stations until such time as the enemy accounts are proved false, or official word from Allied sources is forthcoming. You may listen to this network with assurance that all sources of news will be properly labeled, and that we will interrupt programs only with news of exceptional importance and will bring you frequent summaries of all information available. The Columbia shortwave listening station here in New York has heard the British Radio report the German announcement of paratroop landings and report the announcement without comment. Then BBC followed that German announcement, which I've already given you, with this, and I quote: "Early this morning, people in German-occupied Western Europe received an urgent warning broadcast by a spokesman of the Supreme Command of the Allied Expeditionary Force. It was that a new phase of the Allied air offensive has begun. People living within twenty-two miles of the coast are particularly affected. The German overseas news agency," BBC goes on, "has been putting out repeated flashes. Here is one of them, quote: 'We have just learned that numerous Allied landing craft and other Allied warships were seen in the area between the Seine estuary and the eastern coast of Normandy.'" And that was BBC quoting the German report. And now here in the studio with me is Columbia's military analyst Major George Fielding Elliot, and here's Major Elliot now. GEORGE FIELDING ELLIOT: We must begin by assuming the—or understanding the possibility of that these German reports may be an outright German lie. We must also take into account the possibility that they may be a series of feints intended to divert the German defense and to draw the German forces to other places around the nose of which we actually intend to make a serious attack. The report that a new phase of the Allied air offensive has begun, and the consequent request to the inhabitants of Western Europe to clear an area twenty-two miles from the coast, may be nothing more than an intensification of bombing attacks, or it may indicate the use of paratroops, or it may be, again, a part of the Allied attempt to throw the Germans off their guard. But if we are to accept these German reports as having any value at all, there seems to be some uncertainty as to the location of the Allied landings in France which they report. It is clear that the Germans are saying that landing craft have been observe approaching the French coast between the eastern shore of what they call the "Normandy peninsula" and the mouth of the River Seine, where the port of Le Havre is situated. The Germans are also asserting that this port, Le Havre, is being bombarded, and that Allied paratroops are being landed near the tip of the Normandy peninsula. What is not clear is the reference made to an Allied landing near the estuary of the River Somme, which is some distance northeast of Le Havre. This may possibly be an error for the Seine estuary, though the actual German translation has been checked several times here in the CBS shortwave listening station. But to analyze all these German statements, what the Germans call the "Normandy peninsula" is undoubtedly the Cotentin Peninsula, at the end of which stand the port of Cherbourg. Allied forces would certainly wish, if they were actually landing in France, to obtain a well-equipped seaport as soon as possible, as such a port is essential in order to keep up continuous landings of troops and heavy equipment. We learned at Anzio and at elsewhere that it is not safe to leave such matters to the mercy of the weather, as has to be done when dependence is had on open beaches, or even small but undeveloped bays. Hence a double Allied attempt against the two key ports of northern France, Cherbourg and Le Havre, is well within the possibility if we are to accept these German reports that landings are taking place at all. From the strategic point of view, there is nothing inconsistent in the report of the landing at the Somme estuary. There is no seaport of importance there, but the Allies might well wish to land on a broad front in order to divert the German defense as much as possible, and to keep the Germans from finding out, as long as we could, where the main effort was being made. The landing of paratroops behind the big seaport of Cherbourg would likewise be probable if a landing was really in progress in order to cut off a movement of German reserves toward that port, and thus facilitate its capture by the Allies. But any military analysis must remain fragmentary and uncertain as long as it is based only on German reports which have so frequently proved to be unreliable in the past. TROUT: That was Columbia's military analyst Major George Fielding Elliot, and I think that brings us up to date to the moment. I'd like to repeat that there is as yet no reason to believe this German story which you have now heard. Nevertheless, because of high public interest in this country, Columbia is planning to continue overtime operations tonight, and I should like to take this opportunity to inform not only you, our audience, but to inform also the staff on duty at our affiliate stations around the country, that Columbia is planning overtime operations until such time as the enemy accounts are proved false, or official word from Allied sources is forthcoming. And so, ladies and gentlemen, you may listen to this network with assurance that all sources of news will be properly labeled, and that we will interrupt programs only with news of exceptional importance, and will bring you frequent summaries of all information available.